This week SX is a haven for flutists and unusual animals--with the airy bright fluting of the Quarter Tones Flute Ensemble, and an Animal Vignette called Foxy and the Other from the ever Foxy Marie Elyse St George. 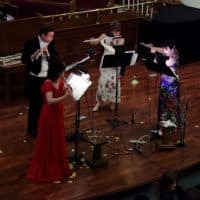 The Quarter Tones Flute Quartet is an ensemble that takes their passion for flute and creates concerts with a wide variety of musical styles. 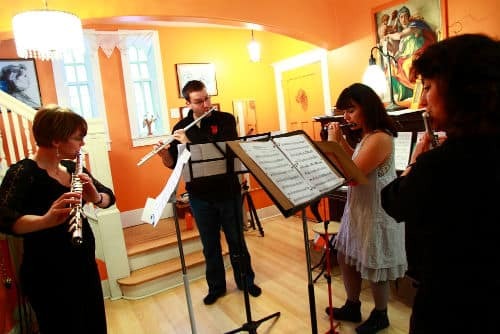 The Quarter Tones Flute Quartet is made up of Regina flutists, Tara Semple, Linda Lucyk, David Popoff and Marie-Veronique Bourque. The Quartertones Flute Quartet was founded over ten years ago by Tara Semple and Linda Lucyk. The Quartertones performs a wide variety of music: sacred, jazz, classical, ethnic, baroque and modern. They are known for their unique, beautiful sonority because they utilize bass flute, alto flute, C flute and piccolo. The members are continually looking for exciting new arrangements for their flute ensemble. They perform at venues as diverse as The Cathedral Village Arts Festival, receptions, school concerts, and the CBC. They have helped the Regina Music Festival by being part of the successful fund raising concert in the fall of 2007. They outreach to the Campbell Collegiate high school flute choir by joining with them for their annual concert. They have performed at the Festival of Trees concert at CBC in support of the food bank. They bring together knowledge about the flute from their diverse backgrounds in Irish, baroque, and classical for a rich musical experience. They are all currently members of the Regina Symphony Orchestra. Marie Elyse St. George was born near St.Catharines, Ontario, and now lives in Saskatoon with her husband. She has two sons and a grandson. 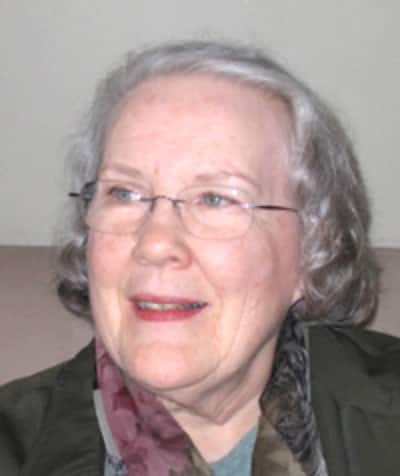 A visual artist as well as a poet and writer, she has worked and studied in Canada, England and the USA, and has exhibited in Canada and New England. Her work has appeared in art and literary publications, and as cover art on the works of several well known Canadian authors. After Coteau Books published her first book of poetry "White Lions In The Afternoon" in 1989, she collaborated with poet Anne Szumigalski for an exhibition of her paintings and Anne's poems at the Mendel Gallery in Saskatoon, SK. The resulting book,"Voice", (Coteau Books/Mendel Gallery)was published in 1995 and won the Governor General's Literary Award for Szumigalski's poetry. Her poems have aired on CBC radio and her latest book, a memoir, was published by Coteau Books in 2006. In "Once in a Blue Moon: An Artist's Life" she writes with a poet's insight, a sharp painter's eye, wit and candour, and uses poetry, prose, and visual art to chronicle family history and her life experience as she worked to expand her understanding of the relationship between literary and visual art. In 2006 she won the Saskatchewan Book Award for nonfiction and is currently working on a series of short stories and "playful poems" with irreverent drawings.